Fast growing, free flowering and easy to prune, Fairy Magnolias are fairly new to the gardening world. Attractive brown felted buds form in winter, followed by open star shaped flowers. The flowers are fragrant and appear from late winter through spring. They are an evergreen Magnolia with a good naturally upright habit. The flower buds form at every leaf axil ( where the leaf joins the stem). They are easy to prune, and in fact make excellent hedging plants. Use them as a stand along specimen, as a screen or background in the garden border, or as a hedge. Fairy Magnolias are available in two colours, white and pink, so we have ‘Cream Fairy’ and ‘Blush Fairy’. These are a hybrid Magnolia bred in New Zealand. 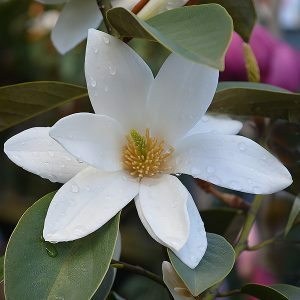 Magnolia Star Bright, an excellent free flowering variety for screening, hedging or a feature plant. Height – From 4 – 5 metres, however easily pruned to 2metres. Spread – Around 2 metres. For a dense hedge plant at 1 metre apart. This will be depend of the shape and growth habit you wish to achieve. Really they can be shaped to anything, from an espalier to a hedge, even a standard. Very easy to prune and best pruned after flowering.